750 mL wine bottles. Antique green color, claret (Bordeaux) style. Standard cork finish. Punted bottom. Sold in cases of 12 with dividers. I like this color and the price. Appeared to be good quality and good reviews. For Cab franc and Shiraz. You are reliable company ! Good bottle to store wine. Fast delivery. I like bottles with a shallow punt. I'm making centerpieces and like the color and style. how many for 6 gallon? 30-31. 750ml = 25.3oz. 6 gallons at 128oz per gal = 768oz total. 5 bottles per gallon. 30 bottles. 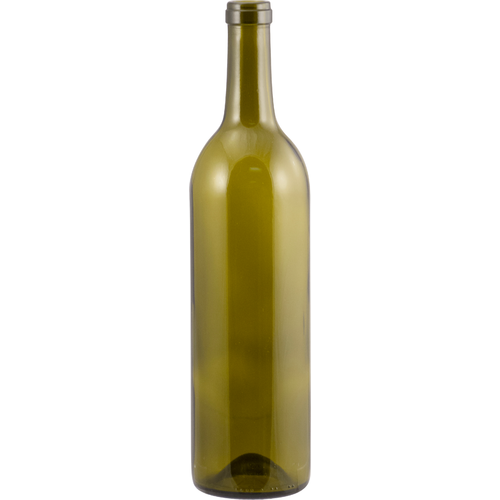 What size cork works with the B373, 750 mL Antique Green Bordeaux Wine bottle? Any size. All corks will fit in the bottles. It is more up to your pocket book and the time frame you are planning on storing. best bang for the buck..
My wife and I made up 10 gallons of wine..and we needed two more cases to finish the run.placed the order and 3 days later TA.DA. we put the wine in the bottles, but wash first, its just my thing..they were all clean no release from manufacturers .. Ordered and got different ones. This was the first time I had an error in ordering. I sent an email and got the correct bottles right away. I was so impressed by the service. Now to fill the bottles. Does the job, I haven't gone so far as to test the durability yet. Very well packaged for shipment though. Ordered 5 cases and 4 of the 5 came in with no problems. The 5th case had 6 of the 12 bottles broken. Not More Wines fault the delivery service miss-handled the case. I only use the best bottle for each of my wine recipes. Absolutely no screw top bottles EVER !! Nice bottles, nice price, and fast delivery. Excellent value and quality. I will continue to fill my bottling requirements from you. Came packed well, no broken bottles. Looking forward to using on first wine kit.